When Should You Consider Hospice With Lung Cancer? When Is Hospice the Right Choice With Lung Cancer? Even speaking the word hospice is frightening to anyone living with cancer. Unfortunately, the word hospice is sometimes equated with giving up, though it is far from that. With lung cancer, many people fail to receive the benefits of hospice until the last days of their illness. At the same time, some people choose hospice unaware that there may be new and effective ways to treat their particular advanced lung cancer. What do you need to know to be empowered in making a decision about hospice; both making sure that you are not "jumping the gun" if effective treatments remain which could extend life with few side effects, and choosing this form of care soon enough that you can receive the benefits? Why Is It Important to Talk About Hospice When You Are Feeling Well? Among people with lung cancer, we know that hospice is underutilized. We also know that many people choose hospice only at the very end of their life—the last days and maybe weeks—missing many of the benefits of this program. At the same time, the treatment of lung cancer has changed dramatically in recent years, and there has been a paradigm shift in the management of the advanced stages of the disease. Medications that were unheard of a decade ago are now enabling some people to live much longer than in the past; even with stage 4 lung cancer. Amidst this change, how can you know if it’s time to choose hospice? Let’s begin by talking about exactly what hospice is and what it might mean for you. Then let’s talk about how to make this painful decision. Unfortunately, studies tell us that many doctors fail to bring up hospice care. What this means is that you and your family may need to initiate a discussion with your doctor, and preferably before the need arises. In addition to having the opportunity to benefit from hospice services, a 2017 study found that an early discussion of hospice with people with lung cancer resulted in less futile aggressive treatment at the end of life. (There was no difference in survival rate between those who had aggressive treatment at the end of life and those who did not.) In another study, family members of people with lung cancer who had early hospice enrollment had a better perception of the end of life care for their loved one than those who did not. What Is Hospice for Lung Cancer? Instead of a “place,” though there are facilities which offer hospice care, hospice is more of a philosophy. It is defined as a practice which provides humane and compassionate care for people in the last phases of incurable disease so that they may live as fully and comfortably as possible. The goal of hospice is the treat the person rather than the disease in a way that doesn't either hasten or postpone death. Many people are confused between hospice care and palliative care since both focus on the relief of symptoms and provide physical, emotional, and spiritual support. A primary difference is that palliative care can be used any time, even with curable cancer, but hospice care is designed for people in the last 6 months of life. There are many myths about hospice care, including the myth that in choosing hospice care you are "giving up." This is far from the truth, and in choosing hospice people are often making a conscious decision to live out their last days in dignity and comfort. Level 1: Routine health care. This care provides basic services from nursing care to emotional support. Level 2: Continuous home care. Continuous home care is usually a short-term option used when severe pain or shortness of breath is present. Care is re-evaluated each day and a nurse or home health aid is present from 8 to 24 hours a day. Level 3: General inpatient care. This service is similar to continuous home care but instead is for people who prefer care in an inpatient facility. Level 4: Respite care. Respite care is a temporary inpatient option for those receiving level 1 hospice care, but caregiver stress is causing difficulties and the family needs a short break. There is usually a 5 day limit on this care. What Services Are Offered by Hospice? Symptom control: Your hospice care team works to provide medications and support to help with symptoms such as pain, shortness of breath, nausea or vomiting, and other symptoms of your cancer or side effects of treatments you have had. 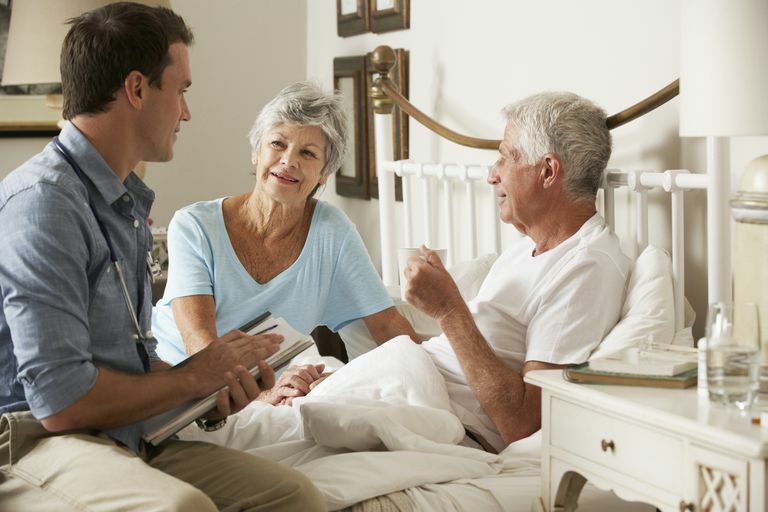 Inpatient care: Most people can choose either home or inpatient hospice care. For those who choose home care, respite inpatient care (for a period of up to 5 days) is offered when family members become overwhelmed or need a break for any reason. Spiritual care: Your hospice care team includes clergy who can help you with the difficult questions faced at the end of life. This care is designed for your specific needs and does not promote or exclude one religious practice over another. 24/7 access: You will be able to contact your hospice care team at any time of day or night with any questions or concerns you have. Family support: The hospice team is family-centered, and in addition to helping your family understand what you are facing medically, support is provided for their questions and emotional struggles. Family meetings may also be held so that family members can share what they are feeling, and talk about their fears and concerns. Bereavement care: For a period of a full year after death, hospice provides services to surviving family members. This can include counseling or clergy in person or by phone. Can You Still Receive Treatment While Under Hospice Care? Many people are frightened about choosing hospice as they believe that treatment stops completely. This is not true. In choosing hospice you make a decision against pursuing active treatment of your lung cancer, but this does not mean all treatments will stop. The difference is that treatments focus on the relief of symptoms and improving your quality of life rather than treating cancer itself. Different hospice providers have different guidelines on what constitutes active treatment. For example, the use of a feeding tube may or not be considered palliative care depending on the particular hospice agency. With lung cancer specifically, hospice care programs may differ in what is acceptable such as the management of a malignant pleural effusion (fluid build-up around the lungs containing cancer cells). Some programs may consider draining the fluid or installing a shunt; palliative measures which improve shortness of breath. Another example would be pain or fractures due to bone metastases. Radiation therapy (or bone-modifying agents) are sometimes used to reduce pain, but may or may not be considered a form of "active treatment" depending on the particular hospice agency. Another consideration may be the use of intravenous fluids if a person is symptomatic due to dehydration. Of course, treatments that primarily address pain, breathing difficulties, and nausea are covered, as the goal is to maximize your quality of life. When Should You Choose Hospice With Lung Cancer? Hospice is usually recommended when the risks and side effects of further treatments will outweigh the benefits. Certainly, this is a balance which each person needs to weigh themselves, and the answer may vary widely between different people. There is not a right and wrong on this spectrum; only a decision which is best for you and your family. It's important to note that with the advances in the treatment of lung cancer in recent years, even changes that occurred between 2015 and 2017, the answer may be very different than it would have been a few short years ago. In the past, with inoperable lung cancer, there were only a few options. Radiation therapy in the setting of advanced lung cancer is primarily palliative—designed to reduce pain and suffering. Which most often left chemotherapy alone as an option which might extend life; and weighing the risks and benefits of chemotherapy regimens was the primary question. This has changed considerably with newer treatment options such as targeted therapies and immunotherapy. It's important that everyone with non-small cell lung cancer have molecular profiling (gene testing) done on their tumor, as not everyone who is eligible for these treatments is aware they are available. If a targetable mutation such as an EGFR mutation, ALK rearrangement, or ROS1 gene rearrangement. Immunotherapy is another option that is sometimes effective (and dramatically so for some people) with advanced lung cancer. These treatments are more likely to be effective if you have PD-L1 testing that reveals high levels. While immunotherapy drugs do not work for everyone, they can, for some people, result in a durable response (long-standing control of cancer). Targeted therapies as well as immunotherapy drugs are not without side effects but are often tolerated much better than traditional chemotherapy. It's important to note that, even if treatment with targeted agents, immunotherapy, or chemotherapy might extend life, some people will choose not to pursue further treatment. Going through cancer treatment of any form is not easy for anyone, and some people are simply feeling too tired to pursue any more treatments In making your choice you need to honor your own wishes and make the choice that is best for you personally, as long as you are fully aware of the options you have. In addition, even though these treatments can be effective at times, eventually most treatments stop working, and a decision about hospice will be faced. Since choosing hospice is essentially making the choice to stop active treatment, take a moment to talk to your family about these issues to consider before stopping cancer treatment. Are there any remaining treatment options? In asking this question you may want to ask specifically about chemotherapy options, targeted therapy options, immunotherapy options, and the possibility of any clinical trials that would be appropriate for you. What is your quality of life like today? What would you wish your quality of life to be? Would any further treatments reduce your quality of life further? Have you had a palliative care consult? Palliative care is care that addresses your physical, emotional, and spiritual well-being even if your intent is a cure. How does your family feel about your decision? Is hospice care covered by your medical insurance or hospice Medicare benefit? Take a moment to list out both the advantages and disadvantages of hospice care. Sometimes seeing these on paper in black and white can make your choice seem much clearer. The availability of hospice care varies depending on where you live and is often easier if you live in an urban rather than rural region. The first decision is to decide if you wish to have at-home hospice or if you wish to be in a hospice facility. There is no right choice, and the best decision is what you and your family feel are right for you. Many communities have more than one hospice provider, so you will need to choose which one best meets your need. Your oncologist and oncology nurse can help. If you are involved in a local lung cancer support group or community, you can ask for recommendations from these people as well. There are also state and national organizations, such as your state's hospice organization, who you can contact with questions. It's important for anyone who chooses hospice care to know that it's okay to change your mind. If you decide you wish to resume active cancer treatment, or if a new drug to treat lung cancer is approved and an option for you, you can always leave hospice. Talking about hospice is a discussion that is difficult for people with cancer and their oncologists alike. Unfortunately, we know that too few people opt for hospice until they are very close to death, and miss out on many of the wonderful services hospice can provide. The decision about hospice with lung cancer specifically entails more questions and considerations than in the past, due to advances in the treatment of advanced lung cancer such as targeted therapies and immunotherapy. No two people or two cancers are alike, and nobody can make this important decision for you. It's important to understand all of your options, and then to make a choice which honors your own needs and those of your family. That said, several studies have found that families of people with lung cancer believe their loved one's quality of life was much better when hospice care was chosen earlier rather than later on in the final stages of the disease. Ersek, M., Miller, S., Wagner, T. et al. Association Between Aggressive Care and Bereaved Families’ Evaluation of End-of-Life Care for Veterans With Non-Small Cell Lung Cancer Who Died in Veterans Affairs Facilities. Cancer. 2017. 123(1):3186-3194. Schuler, M., Joyce, N., Huskamp, H., Lamont, E., and L. Hatfield. Medicare Beneficiaries With Advanced Lung Cancer Experience Diverse Patterns of Care From Diagnosis to Death. Health Affairs. 2017. 36(7):1193-1200. Wright, A., Keating, N., Avanian, J. et al. Family Perspectives on Aggressive Cancer Care Near the End of Life. JAMA. 2016. 315(3):284-92. Yoo, S., Keam, B., Kim, M. et al. The Effect of Hospice Consultation on Aggressive Treatment of Lung Cancer. Cancer Research and Treatment. 2017 July 14. (Epub ahead of print).